Is your dad always busy in the kitchen? Or is he always working? 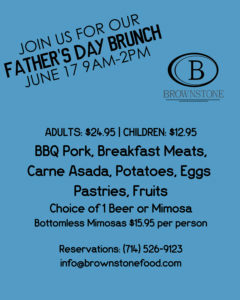 Well you can treat him to an awesome brunch here at Brownstone for Father’s Day! Being a family-owned business, we know the importance of treating dads with a great day and a great meal! On the 17th, we will be having BBQ Pork, Breakfast meats, pastries, fruits, and much more! Take your dad out to Brownstone and have an awesome time!